Awhile back, aLearning conducted a brief survey to get some insight into the biggest challenges association learning vendors face in our segment. 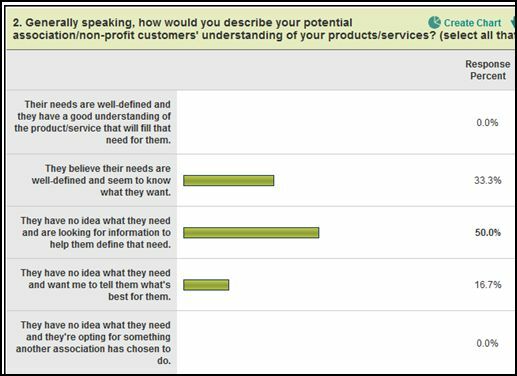 Turns out, there’s a lot learning leaders in the nonprofit sector can discover from what they had to say. Most responding organizations provide consulting services (nearly 90%) and more than half (56%) provide learning management/learning content management systems (LMS/LCMS) as their primary product/service (P/S). None of the organizations provide Web Conferencing systems as their primary P/S, although one company reported it as a secondary P/S. One organization reported their primary P/S as an association management system. The majority of companies are very small, with ten or fewer employees (73%) while another 20% employ 20-100. A majority (67%) reported that half or more of their annual revenue is generated from professional/trade associations, societies, and/or other institutions, while another 13% reported at least half of their revenue comes from non-profit charities and/or philanthropic organizations. So how do these vendors see their association clients? Do their perceptions match your reality? A quarter of the respondents said they believe their clients expect more for what they’re spending. You’d agree with that, I’m sure. Don’t we all want the maximum value for our investments? One respondent added a comment that said, in part, that clients have some idea of what’s needed, but “do not feel their needs are well defined or feel comfortable that they understand all the options.” Perhaps because of this, most respondents also said they anticipate that the biggest purchase next year in the learning segment will be for consulting services — contracting for help in defining those needs and making the next step. What Advice Do Vendors Have? Maybe one of the most valuable findings from this survey is discovering how we can work better with those providing learning services and products. Just as there are many things you wish vendors understood better about your job and its challenges, there are things they wish we understood better or would do differently. Sometimes we just don’t understand what our vendors’ specialties are, and that means we all fail to maximize working together. One provider noted that this can be the due to a weak understanding of elearning in general, resulting in confusion about which vendors provide products such as an LMS and which provide custom content development or other aspects of elearning. Such confusion can make for a longer process and risks a disconnect between what an association needs and what it gets — and the awful gap that can unfortunately result, not to mention wasted money. We don’t want to admit that sometimes we have to “spend money to make money.” Recognizing that we need to make investments in P/S that could take some time to earn back is important if we want to move forward, especially when we must invest in expensive outsourcing for elearning development or an LMS. The advantage of getting third-party advice, especially from a “detached source,” is often overlooked, so we end up paying more in lost causes than had we invested in some good guidance up front. How well do we understand the difference between “information” and “education”? Or “training” for that matter? Do we really comprehend what it takes to translate that content so it delivers on its outcomes online? Learning P/S providers clearly appreciate the challenges alearning leaders face every day, from securing funding to the grindingly slow committee-board approval process that we generally operate within. One respondent commented on the limited time staff members have for any given task. In short, we’re overextended and underfunded. Another respondent remarked on his perception that “learning initiatives simply are not among the highest priorities” in some organizations, which affects how they are managed… which, of course, affects how vendors fit into the scheme. The more you know about elearning and how it works, the better partner you can be with your learning vendors. You’ll have clarity about what you need and why you need it, and you’ll be able to formulate your questions in ways they’ll can answer that help you both. As much as you learn about elearning, you should remain open to the suggestions of your vendors. It’s their professional space, after all, and it’s in their best interest to help you achieve your goals. Consider hiring a consultant to help you plan elearning implementation, especially if you have a small staff, lack IT infrastructure, or face other challenges. The investment will be well worth it. Get curious about the possibilities. Accept there are more options than content management systems (such as iCohere or Blackboard), and that you can provide alternatives to Webinars. Thousands of resources are available to you — so many that it can be overwhelming. Add this blog to your RSS feed and use the search function or tags to read more on various topics. If you don’t have a copy of “aLearning: A Trail Guide to Association eLearning,” get one. “This is one of the best-executed books I have seen in some time on the topic of learning strategy. In my opinion, every association should have a copy of thisto refer to during creation or revision of the professional development curriculum. It will be particularly useful to associations with small staffs….” So wrote William Brandon, editor of the E-Learning Guild’s Learning Solutions e-magazine. Follow the blue Lulu link to find out more about how to get your copy. Have your own questions for association-sector learning vendors you’d prefer not to ask face-to-face? Send them to Ellen and she’ll include them in her next vendor-specific survey! This entry was posted on April 15, 2011 at 7:46 pm	and is filed under aLearning Strategies, aLearning Surveys, aLearning Trends, Financing eLearning, Justifying aLearning, LMS, Online Learning in General, Social Learning. Tagged: aLearning, association, benchmarking, Bill Brandon, business planning, e-learning, elearning strategy, LMS, research, resources. You can follow any responses to this entry through the RSS 2.0 feed. You can leave a response, or trackback from your own site.